We have had a wonderful Christmas and week after Christmas...I will update with all details and photos probably tomorrow. It was great to spend lots of family time with ALL our children and also with extended family. Everyone have a safe and wonderful New Year's Eve. I am up bright and early this Christmas Eve....I was trying to think of a creative post, but decided to just wish everyone a Merry Christmas! Wherever you are, whatever you have planned for Christmas....I hope you have a wonderful one! 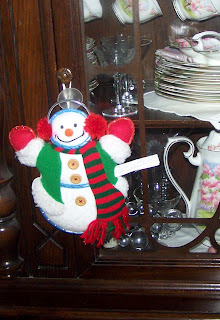 We will be home most of the day and my husband has invited some locals to drop in as they can....later this evening my daughters and I may head over to my sister in laws for an hour or so, weather permitting...to see some family...then it's home for hot chocolate and a Board game...and off to bed. Nova Scotia got hit with a major storm last night/today...with snow, and hurricane force winds....we lost power this morning, thankfully we have a generator, however, our main source of heat when the power is out (only source actually) is our pellet stove and we are unable to get pellets this year!! We have ONE bag left from last winter that is sitting by the stove in case we need it.....our power was off for a few hours, and then came back on, so the house warmed up...then it went off and is still off. We are expected to get power back my midnight. Some parts of the province may not get it back until tomorrow night. If there is one thing I am forever thankful for...it's our generator! We had it installed when I sold my parents home, and it will last a couple of weeks! It's wonderful!! Tonight I plan on sitting in my stitching chair, with my heating pad for heat...LOL and stitch the evening away. DH has to go pick up our daughter at 11pm at work. Her boyfriend came an picked her up earlier today and drove in. Speaking of boyfriend...I gave him his present from DH and I on Saturday night, as he is leaving tomorrow to spend Christmas with his grandparents....and parents ofcourse.....anyway, I had made him one of my blankets and was truly touched by how much he loved it!! It's nice when a handmade gift is genuinely appreciated. I did not take a photo of him with the blanket, wish I did!! Take care...stay warm........and will post again tomorrow when I hope the house is a bit warmer!! So...you may remember that several weeks ago I did a post about how my girls were going to have a party....well, my oldest decided that since she is working so many hours and busy with school, plus she turns 18 over Christmas vacation, that she would rather have a few friends in later (after Christmas)...so we decided to let youngest invite a few friends for a party after school...thankfully 3 of the 10 invited couldn't come (oops did I say that...LOL)....and two of the 4 invited to sleep over couldn't....so I ended up with 8 (counting mine) 11 year old girls getting off the bus at 2:45. I know they all had a good time....but geesh.......one girl laughed like a hyena (sp) the whole time.....and thought that there wasn't much food (I'm beginning to wonder what she eats at home! LOL)...the "not much" food...was a fruit tray with 4 kinds of fruit, a big bowl of chips, two kinds of drinks....a big platter of mozerella sticks, a big platter of mini pizzas, and a big platter of nachos!! (I thought that was pretty good, considering pick up time was 6:30)....and homemade cupcakes for dessert! Another girl left 45 minutes early because she couldn't stand to be in the same house as her ex-best friend. (see where I'm going with this!! )....all in all it was a great time for the girls, but it's just amazing how these girls act sometimes! I KNOW they would not do this at home, so why would they do this when they aren't at home? I did favours for the girls to take home, and we had a Dollar Store gift exchange (I just found out that the girl that went home early took her present and the present of one of the girls staying all night! (I'll have to dig out the stocking stuffers I have and find her a gift later). Anyway, here are some photos of the cupcakes I made (in a shape of a tree), the party favours ( two candy canes, a Christmas straw and a Christmas pencil) and a container of candy canes...we had them guess how many Candy Canes in the jar. A few years ago, my daughter loved Cabbage Patch dolls (she still has one on her shelf in her room) and now she likes Build-A-Bear......anyway, as I mentioned, a few years ago I knit her a box of cabbage patch clothes for Christmas, to go with the cabbage patch doll my mom was giving her for Christmas and Katy, Sara informed me this morning that this doll is named Madelyn! I had totally forgotten that! This box of clothes was loved very much and still is used all the time with her friends and Build a Bear. I got her to take a few pieces of the clothing out this morning to photograph. Katy, you will absolutely love knitting clothes like this...it is so much fun! I made alot more, but my all time favourite is the cream coloured cable sweater, brown hat and brown pants. I will get to the patterns today and hopefully get them in the mail to you in a couple of days. 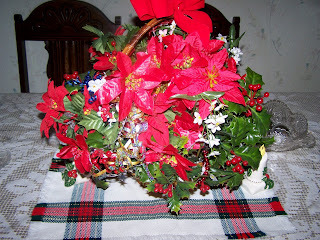 Have a great day everyone....after the house clears out..I am off to wrap presents!! 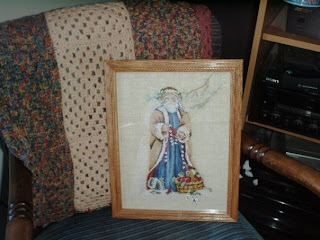 I have been thinking about what it is that I really like to cross-stitch...for the larger projects....I have come to the realization that I really like Santas! 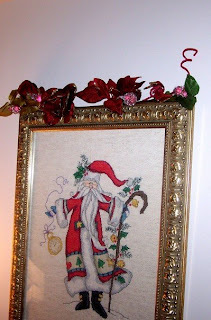 I like the "old world type" Santas. I bought this book at the TS a couple of weeks ago. ..and I have been looking through it...I had a Santa chosen in my mind, but asked my girls which one they liked...they picked the same one I did without knowing! It will be a challenging one, as it's done on black, but I think I can do it. I have hopes of starting this New Year's Day, providing I can get the fabric from Joanne at 123 stitch on time. (I have already ordered it, so she's fast, I shouldn't have a problem getting it)....and I will leave this up all year. I am thinking this may be something unique to display in my home...maybe add one or two to the collection, maybe it'll be something people like to see when they come to visit. ....so now I am a bit excited about this new project. I will ofcourse have others on the go, but I will work away at this and finish it up in time for the Holidays next year. I finished up my shopping this morning! Now I just have to organize it and wrap...I'll do that on Wednesday, as tomorrow I have to go out. Have a great afternoon and evening everyone!! Saw this on one of my friend's Blogs, so decided to do it. 1. Wrapping paper or gift bags? Both. It depends on the gift and also what I have on hand. I tend to buy paper and bags after Christmas for the next year. 2. Real tree or Artificial? Artificial. It creates less hassle and I like to get mine up early. This way I get my pre-lit tree out of the box and put it up and voila...all lit. LOL Hey, works for me! 3. When do you put up the tree? Around the end of November. 4. When do you take the tree down? Around New Year's Day. 5. Do you like eggnog? It's okay, but I don't usually have it. 6. Favorite gift received as a child? My cousin made me a box of Barbie Doll clothes...I LOVED those so much! This is the older cousin I see each week now....she's like a sister to me. 7. Hardest person to buy for? At the moment, my 14 year old son! 8. Easiest person to buy for? My 11 year old daughter. 9. Do you have a nativity scene? Not really. I have Mary, Joseph and Baby Jesus, which is actually from Avon...all white and I really like them! 10. Mail or email Christmas cards? Mail. 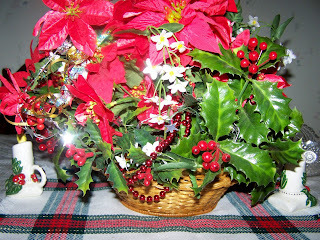 Some people I send to do not use the computer, but I would not email Christmas cards anyway, not personal enough for me. 12. Favorite Christmas Movie? The Grinch that Stole Christmas...origional cartoon version. 13. When do you start shopping for Christmas? Sept.
15. Favorite thing to eat at Christmas? My mom's dressing, and now that she is no longer here, I make it! 17. Favorite Christmas song? Deck The Halls. 18. Travel at Christmas or stay at home? We stay home, we always used to go to my inlaws, but my father in law passed away two years ago and now there is no more open house at that place....so...last year we stayed at home. 19. Can you name all of Santa’s reindeer? Dasher, Dancer, Donner, Blitzen, Cupid, Comet, Prancer and Vixen. 20. Angel on top of tree or star? Star. 22. Most annoying thing about this time of the year? Can get pretty stressful! 23. What theme or color are you using when you decorate? 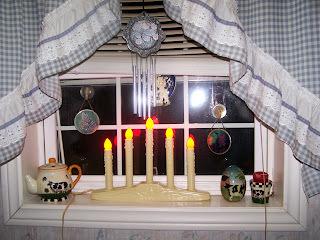 I use alot of red...don't really have a theme...have a lot of older decorations. 24. Favorite for Christmas dinner? Turkey and all the trimmings. Well today I had planned on going out to finish up my Christmas shopping. (It's hard to go without my youngest unless she is at school).....but my DH did not hear me say this, and decided today was a good day to take my car for it's safety inspection and oil change..LOL...actually it's fine.....it's such a nasty day that I am glad. I will try and get out tomorrow while youngest is at a Birthday party. I know what I want...just have to go and get it. 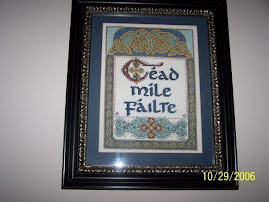 So that changed my plans for today...and since I finished up the stitching on this piece last night....I will do the sewing it into a wall hanging today....I like this...."We Believe"...it was a little kit and a fun stitch. I'll take photos later when I finish up the "finishing"...take care everyone and have a wonderful day!! 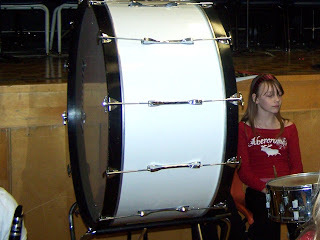 This week has been busy with a storm day, a Band Concert and a Christmas Concert..with the band playing at that as well. Last night was the Christmas Concert...and I was a little sad...it's the last Christmas Concert at that school for my children.....I've attended them since 1996!! 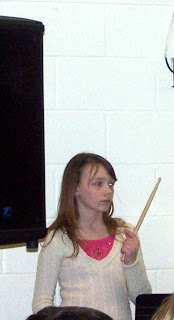 My youngest wil be in junior high next year. Also, I need to finish up my shopping...just need a nice day to get out and finish!! BUSY WEEKEND AND A SNOW DAY!! EDITED to ADD a Kids Photo! The kids have no school today..it snowed quite a bit last night! As of right now, the house is still very quiet.....they don't know there isn't school yet...LOL. It's been a busy weekend! Friday night, my three cousins and myself went to see "Holiday On Ice" at The Metro Centre in the city...wow! What a fantastic ice show!........lots of talent.....Kurt Browning, Sasha Cohen,Jamie Salé & David Pelletier, and lots more! Th icing on the cake was that fiddler Natalie MacMaster played the music, as did The Cotters. For those not familiar with those names.....they play Celtic music, and what better place for Celtic music than Nova Scotia! It was an amazing show! On Saturday, same 3 cousins and myself headed out to a neighbouring town to do some shopping and have lunch! We spent the afternoon and evening doing some Christmas shopping and eating lunch at a wonderful restaurant! What a great way to spend a day! Today was supposed to be the day I wrapped Christmas presents, but that isn't happening with the kids home from school!! Maybe I'll work on my Christmas cards instead!! EDITED: I actually managed to get ALL 3 kids and the dog in a photo!! This will go in some Christmas cards as I don't have my daughter's grad photo until just before Christmas, and I don't have enough wallet photos of the other two for everyone...so this will solve that problem..LOL I think it's okay. My son has his "riding his dirt bike splash pants on, but that's okay. This is on our dining room table. 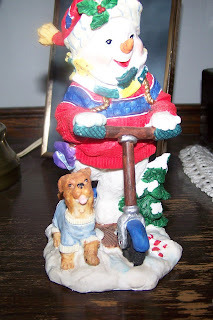 This little guy was given to mom by my son when he was about 8 or 9. She loved it because he picked it out himself and at that time he was big time into scooters....this little guy is riding one. This is now on our buffet in the dining room. I am off to take oldest to the Dr....she is sick today....have a good day! 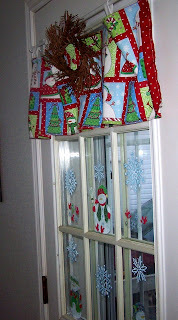 Here is the 3rd window topper I made. This one is for my front door, and is made a bit differently, but I am liking it! 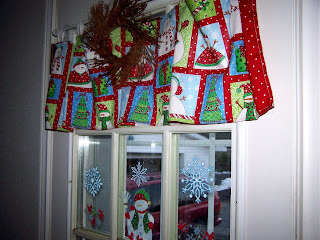 I have window decals of snowmen and snowflakes on the windows as well, they don't show up in the photos. 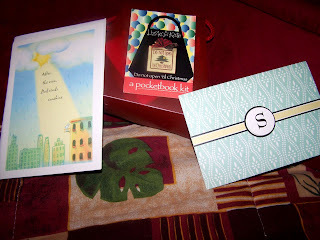 I want to also thank Sandy, I received this wonderful cross-stitch kit and two wonderful cards from her today. She had a giveaway on her blog and I won!! Thank you Sandy, I value your friendship! 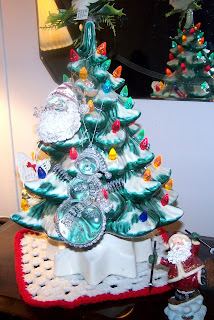 I've been trying to get my decorating done...this tree was made by my aunt about 30 years ago. I really like it. The other photos are just random. I'll take some more tomorrow.